Convocation: Thursday Sept 20, 9:30 am: Members of the UMass community will deliver a petition with chanting that will last for 5-10 minutes. There is no obligation to join in the chanting but we do hope you will come and show your opposition to the parking fee increase. Give testimony during bargaining: on Thursday Sept 20 at a time to be determined or Wednesday September 26 at a time to be determined. If you cannot come to testify in person, please send your comments to FSU@umb.edu. We will collect your comments, keep them anonymous, and present them to the university at one of our bargaining sessions. Join the bargaining organizing committee. Contact the FSU at fsu@umb.edu. Want to lobby state legislators? Contact the FSU at fsu@umb.edu. 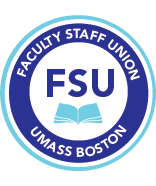 Board of Trustees Meeting: Wednesday September 19: UMass Lowell, UMass Lowell Inn and Conference Center, Main Ballroom, 1st floor, 50 Warren Street, Lowell, MA, 9 am: FSU President Marlene Kim and PSU President Anneta Argyres will address the Trustees on the debt at UMB and why we should not pay $15/day in parking. Please come support them. We have been receiving a lot of email on the topic of parking and parking bargaining. Please see the FSU blog for arguments for getting involved in our organizing campaign; see here for an argument for progressive (by income) rates and encouraging public transportation. ►Your salary increases: The University of Massachusetts System office is in the process of submitting to the Governor our contracts. They are working on this so that these will get approved. We will let you know if we need your help getting these approved. ►Help adjuncts at UMass Lowell: this Wednesday, September 19, 8 am. UMass Lowell, Inn and Conference Center, 50 Warren Street. They are the only adjuncts who do not have health care benefits in the UMass system. ► DPC/CPC training: is on Tuesday, October 2nd at 1 pm, Chancellor’s Conference room, Quinn, 3rd floor. Co-sponsored by the Office for Faculty Development and the FSU, this is designed to aid DPC and CPC chairs or their representatives to inform them of the process, and the rights and responsibilities in promotion and review. ► Additional students above course capacities: For both in-person and distance learning courses, once course capacities are reached, only the individual faculty member may admit additional students (see Article 15.4 of the contract for more information). Faculty members have full discretion in this regard. There is no longer additional compensation for admitting students above the course capacity for distance learning courses (as well as other courses except large enrollment courses in some Colleges). It’s the administration’s option to open another section.